John English | Chief Technical Officer, CCI It appears that regulatory authorities in the U.S. are increasing controls over horizontal directional drilling (HDD) at local, state and federal levels. Is this unneeded government incursion or the result of ever-falling industry standards? Experience..
BENTONITE Baroid Industrial Drilling Products, (281) 871-4613, baroididp.com Aquagel: Premium grade Wyoming sodium bentonite used as viscosifier and filtrate reducer in freshwater drilling fluids. Meets the requirements of API Specification 13A, Section 9. NSF/ANSI Standard 60 certified. Bore-Gel.. In the wee hours of the morning, long before the sun comes up and tourists line up to visit “The Happiest Place on Earth,” the crew of K3 Directional Drilling Inc., was working on installing new water lines to the water bridge at Walt Disney World Resort, where ferry boats float over buses. The Stu..
Hard Rock Directional Drilling LLC recently completed an 8,414-foot-long horizontal directional drilling (HDD) installation of 30-inch diameter steel pipe in Midland, Texas. Three smaller-diameter flex steel pipes were placed in the larger pipe before it was pulled in. The complex project included ..
About a decade ago, residents and businesses in Branson, Mo, got access to gas service. Gas was a long time coming to this area. Located in the Ozark Mountains of Southwest Missouri, the city is home to the popular Silver Dollar City resort and entertainment complex. For years, several gas service.. The business of horizontal drilling poses many risks, and unanticipated problems can cause completion deadlines to be missed or even prevent a job from being completed. Having a drill string or product pipe stuck in the bore hole is something all drillers hope to avoid. Even though there are steps .. 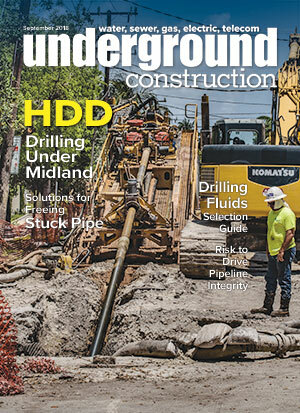 Underground Construction magazine has covered the evolution of horizontal directional drilling (HDD) since the first compact drill rigs made their appearance on utility job sites in the early ‘90s. The magazine publishes reports about HDD projects and products of interest to the industry, and over .. The RehabZone™, exclusive to UCT, offers attendees a “hands-on” look at the history and best of today’s trenchless technologies for the rehabilitation of aging infrastructure. The exhibit-within-an-exhibit is where you can see the methods used in North America over the last 200-plus years. Then, ex.. Underground Magnetics, a new company backed by more than 70 years of combined experience, is changing the way companies buy HDD locating systems. “We produce a powerful locating system at a very competitive price point,” said Mike Young, president, who has more than 30 years of experience, includin..
Komatsu America Corp. and Propeller Aero Inc. are partnering to boost the efficiency of construction job sites using drone-powered mapping and analytics software. These are key components of Komatsu’s Smart Construction initiative – a range of integrated hardware and software products designed to of.. The ARS610 hydraulic puller is ideal for a wide range of underground pulling applications, including power transmission and distribution cable installation, telecom and fiber. With more than 10 tons of pulling force, it offers industry-leading features like a negative self-acting hydraulic brake, a.. The latest Cat D8T dozer is designed to move more material in less time, at a lower cost per ton, for a faster return on equipment investment. The bulldozer features an all-new fully automatic transmission, delivering up to 18 percent more productivity without consuming more fuel, as well as unprece..
Gulf Energy Information has added the World Pipeline layer to its Energy Web Atlas (EWA), the ESRI-based GIS platform introduced earlier this year that tracks detailed data – including operators, shareholders, pipeline route and pipeline specifications – for more than 3,670 natural gas pipelines glo..
Tim Dunphy was named marketing director of Underground Technologies, managing new product development, partner relations and new business opportunities for RIDGID’s line of diagnostics, inspection, locating and drain cleaning products. Dunphy is an accomplished marketing leader with proven ability t..
Tripp Williams joined the Underground Construction sales team in late July. He replaces Gary Lindenberger and Doug Fix in the southcentral and southeast U.S. territories, respectively. Williams is a native of Virginia and a graduate of Roanoke College. He moved to Texas in 2015 after marrying his w..
Sandvik, a high-tech and global engineering group, acquired Inrock, a privately-owned supplier of rock drilling tools and services for horizontal directional drilling (HDD) in North America. Based in Stockholm, Sweden, Sandvik GroupSandvik offers products and services that enhance customer producti..
Avanti International appointed Britt N. Babcock, P.E. as president, with an agenda for exactly what customer segments expect from the company: speed-to-market with new innovations. Engineers desire new specifications based on in-situ conditions, while municipalities want specification statements. D..
Gary Oradat, P.E., is the new director of water utilities at Halff Associates Inc. With nearly 40 years of experience in the public sector, his areas of expertise span: Water resource planning and implementation Wastewater collection system analysis and planning Municipal infrastructure plannin..
Jennifer Steffens, P.E. | NASSCO Pressure Pipe Committee The management of critical infrastructure is a major challenge for water and wastewater utilities as populations increase, available resources decrease, and pipelines need to be maintained, since wholesale replacement of these assets is not.. While the Trump administration has punted on preparing an infrastructure development proposal, Rep. Bill Shuster (R-Pa.), chairman of the House Transportation and Infrastructure Committee, has not. Shuster produced a discussion draft of potential legislation on July 23. The discussion draft include..
Don Thorn, who recently retired as president of Welded Construction after a long, successful career in the pipeline industry, died Aug. 3, in Perrysburg, Ohio, at age 69. He started working in the industry at age 16, after graduating as valedictorian of Vina High School, in his hometown of Vina, Al.. The Virginia Tech Sustainable Water Infrastructure Management (SWIM) Center is offering the Digital One Water Smart Utility Water conference, Dec. 5-6, at its Research Center in Arlington, Va. Addressing one of the most pressing societal needs over the next several decades, the conference will focu..
An updated model specification for high-density polyethylene (HDPE) conduit has been published by the Plastics Pipe Institute Inc. (PPI), the major trade association representing all segments of the plastic pipe industry. Document MS-5 Model Specification for HDPE Solid Wall Conduit for Power and Co..
Robert Carpenter | Editor-in-Chief I’ve spent some frustrating times both calling companies and getting on their websites the past few years. Now, I’m getting downright infuriated – and that goes for both general markets and underground infrastructure companies. Quick, responsive customer service h..